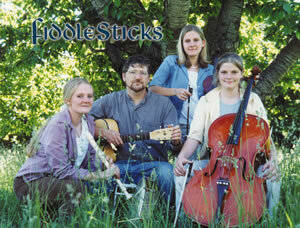 FiddleSticks is the Davis family folk group that performs folk songs and traditional tunes from the Celtic lands, from England, and from America. Our band is made up of three sisters, Rebecca, Kathryn, and Elizabeth, and their dad Marco Davis. Marco's wife is Andi. 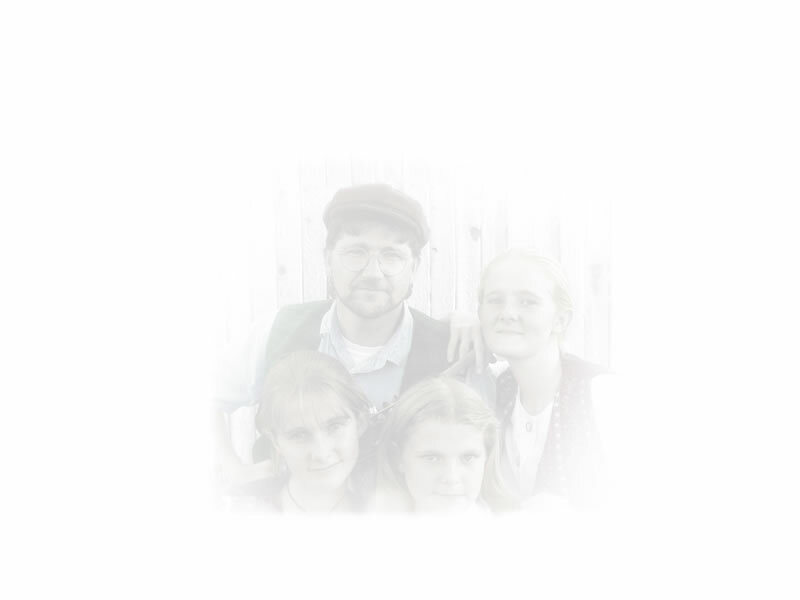 Featured instruments include fiddle, flutes, cello, bodhran (Irish drum), guitar, and vocals. We've made eight recordings, "A FiddleSticks Sampler" (1998), "Playing Favorites" (1999) and a Christmas CD called "Cold Fusion" (2000), "Time and Again" (2001), "Cat and the Fiddle" (2002), "Return to Nauvoo" (2004), "Ampersand" (2006), and "Farewell to Nauvoo" (2006). Liz's Celtic Cello album "Big Fiddle" (2009) is the latest addition to the FiddleSticks musical family. Our music is a mix of traditional dance music, together with original pieces by the group's own young composers (Katie and Liz), as well as plenty of "storytelling" songs of life, love, and laughter. Each of our CDs has been a final nominee for Pearl Awards, which are kind of like the Utah Grammys. "Ampersand" was selected for the 2008 "Best Contemporary Instrumental Album" by the FCMA, and "The Cat and the Fiddle" was awarded the Best Contemporary Instrumental Recording Pearl Award in 2003 for the track "See Spot Run." And "Return to Nauvoo" won a Best Art Design award for our designer Cindy Ferguson. We have performed on various television and radio programs, were official 2002 Salt Lake Olympics Cultural Arts performers, and our music appears on numerous CD anthologies, including the LDS Styles series, and the Timpanogos Singer Songwriter Alliance compilations. We got our start in 1991 while living in Takoma Park, Maryland. We then moved to Orem, Utah, right near the mouth of Provo Canyon where we moved in 1996. After many years of being based in Utah, the FiddleSticks "diaspora" has us now spread all over the place: Becca now lives in Hawaii, Katie's trekking the world with plans to teach in Korea, Liz is finishing at Berklee in Boston before moving to Limerick Ireland. FiddleSticks really is about World Music! Click here to contact FiddleSticks. Rebecca plays flute, recorders, and pennywhistles, and is the group's chief vocalist. She sometimes plays bodhran as well, and has been known to turn her flute case into a percussion instrument. Becca loves quilting and hoarding interesting fabrics. She is an imaginative and enthusiastic gardener, loves hiking and camping, and reading thick historical fiction. She has also participated in several professional theatrical productions; "Trail of Dreams", "Little London Christmas" and a touring company of "Saturday's Warrior." Becca served an LDS mission in Tokyo Japan, graduated from BYU in English and secondary education, and is now living in Kauai, Hawaii with her husband, Matthew Stevenson and cute baby Roselani. Becca got her MA in Folklore/Athropology at UC Berkeley in California, and now designs online classes for a Hawaiian charter school. 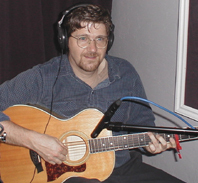 Matt plays Hawaiian "slack-key" guitar, bouzouki, pennywhistle and mountain dulcimer. They are a folk music success story, since they met in Mark Geslison's BYU Folk Music Ensemble. Becca studied classical and theater voice with Kathryn Laycock Little and classical flute with Laura Mauer. She plays a variety of recorders and tin whistles, as well as a silver flute. Kathryn is the band's fiddler, vocalist, violist, mandolinist, occasional guitarist, and has written much of our original music, and produced the 2002 CD "The Cat and the Fiddle" and co-produced, whith Liz, the 2006 CD "Ampersand." Katie graduated in violin performance and environmental science Utah State University. Her husband Sam is an enthusiastic music appreciator. Kate is a natural performer, at home on the stage. She has been in several musicals, including Joan in "Dames at Sea," the Fiddler (of course) in "Fiddler on the Roof," Sister Robert Anne in "Nunsense," the onstage fiddler in "Tom Sawyer" at the Hale Center Theater, and Mary Lennox in a two-week run of "Secret Garden" at the de Jong Concert Hall at Brigham Young University. In addition to her FiddleSticks gigs, she has performed jazz/rock violin with the rock bands Neverband and "the Acoustics," with whom she recorded a full length CD, and has done studio work with the Ed Stevens Band, Loki Mulholland, the BYU Motion Picture Studio, and Kyro, another rock 'n' roll band. She's a talented artist and makes great woven and beaded jewelry. Kate has studied with Jack Ashton in Salt Lake City, Kaye Nally in Highland, Utah and Yvonne Baasch in Takoma Park, Maryland. She has also had classical master class lessons with Nicolas Kendall, Terry Durbin, Robert Richardson, Hiroko Primrose, Michael McClean (the Texas violinist, not the Utah guy), and fiddling with Jerry Holland, the Kane Sisters, Sam Bigney, Matt Glazier, Bonnie Rideout, Natalie McMaster and Janice Anderson. Kate's violin is an 1890 Rudolph Wurlitzer, from Weavers in Maryland. Of course in Fiddlesticks, she plays fiddle: but as she likes to remind audiences, a fiddle is just a violin with attitude. Elizabeth plays cello in the band and has written several of the tunes on our recordings. 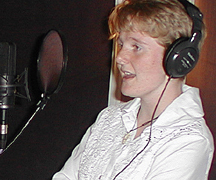 Liz produced and arranged much of the music for our 2004 hymn CD, "Return to Nauvoo" and co-produced with Katie their 2006 album "Ampersand," which was awarded the 2008 Pearl Award for Best Contemporary Instrumental Album. Her latest recording is "Big Fiddle," a collection of original tunes that showcases the versatility of the cello in folk and Celtic genres. Liz is finishing a cello performance major at Berklee College of Music in Boston, where she has studied with Eugene Friesen and Natalie Haas. Previously she studied with Patricia Pinkston and Julie Bevan at Brigham Young University. While at BYU, she was a member of the Philharmonic Orchestra and toured with the Folk Music Ensemble. 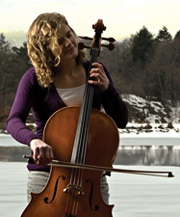 Liz was awarded a Fulbright scholarship that is sending her to Ireland in September 2009, where she will be the first cellist ever to pursue a Master's Degree program in Traditional Irish Music at the University of Limerick. Liz has been teaching privately in and around Wakefield, Massachusetts, where she lives with her husband Andrew Maxfield, an accomplished musician in his own right. She's also a regular participant and teacher at the New Directions cello conferences. Her latest creation, the Folk Arts Quartet (or "FAQ"), has risen to popularity in New England folk scene. The FAQ was a hit at the 2009 Folk Alliance convention in Memphis, TN, and will be touring the U.S. and Canada throughout 2009. Liz believes that if a violin played with folk attitude is a fiddle, then when she is playing jigs and reels in our band she is playing a "chiddle." She is also an enthusiastic gymnast, a fanatic Ultimate Frisbee player, an avid rock climber, and for many years was a performing member of the Rinceoiri Don Spraoi Irish Dancers. Besides her acoustic cello (made for her by J.P. Lucas of Salt Lake City), Liz also plays a 5-string electric cello by Ned Steinberger. Marco is the dad, proud of his musical daughters. He plays guitar and the bodhran in the band, and drives the van. His day job is with Davis & Leiman, an international trade law firm in Washington D.C., and he teaches part-time at BYU law school. Marco plays the guitar -- three guitars really (but not at the same time). He's got a classical-style nylon strung Yamaha for being civilized, a Taylor 6-string for everyday, and a Yamaha wire 12-string for when the mood strikes. He studied classical guitar with Marlo Sagers as a kid, and more recently folk guitar with Connie McKenna of Ceoltoire, with a remedial lesson or two from John McVey. Marco also plays the bodhran, or Irish drum. His bodhran is a 18-inch drum with a tunable fiberskyn head. (The Utah climate is so dry that goatskin drum heads go tight and brittle without constant care and tending. Synthetic to the rescue!) He plays in the Kerry style, using a poplar tipper he turned on his lathe in the garage in the Chris Caswell design. He learned bodhran from Simeon Bigney and Chris Caswell. Andi Pitcher Davis married into the FiddleSticks family in July 2001, but she has been part of the FiddleSticks project for years. She met the Davises in 1997 at a BYU folk ensemble concert where she was performing. Then 12-year old Katie was so enthralled with the music that she insisted on going backstage afterwards to meet the performers, and the rest is history. Andi's instrument is hammer dulcimer, and she often plays with the FiddleSticks ensemble. She performed and toured worldwide for several years with the BYU Folk Ensemble and Folk Dancers, and has performed widely as a dulcimer soloist. She and Kristen Washburn wrote and produced a dulclimer-violin CD called Obsidian Rain, which has influenced many later FiddleSticks arrangements. 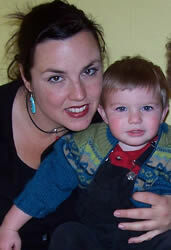 Andi and Marco happily welcomed son Xanny in October 2002 and daughter Zina Sabine in November 2004 as the newest members of the FiddleSticks clan. You can see more photos of the Davis family in our Family Gallery.